I've originally written this article in September 2011. Given that I've had several discussions about multiplexing inside of messaging solutions in past few days, I've decided to re-publish a slightly improved version. Some messaging technologies (e.g. 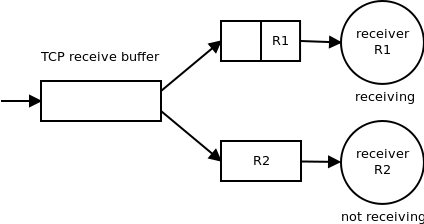 AMQP) allow for multiplexing several data streams on top of a single TCP connection. Distributed messaging systems such as ZeroMQ which assume lot of small independent services running on a single box or even inside a single process seem to make this kind of multiplexing even more desirable. The idea is to use only a single TCP connection to speak to all the services on the other side of the network. This article introduces the requirements for such a system, it describes the technology needed to provide it and discusses the advantages gained. Opening multiple connections can cause excessive TCP handshaking and thus prolonged start-up time. There's only one port open in the firewall. Even when there are multiple services to be accessed from beyond the firewall, they should all share the same TCP port. EDIT: While the algorithm above does implement multiplexing on top of TCP, it does not fully match — performance-wise — mutliplexing solutions built directly on top of IP. 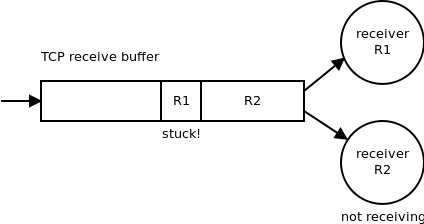 The reason is that with TCP one lost packet prevents delivery of subsequent packets, even though the latter may contain data from unrelated channels. Thus, we are getting transport-layer head of line blocking and thus higher latency on all channels in the case of loss of a single packet. This restriction doesn't apply to low-level multiplexing solutions such as SCTP or QUIC. It was assumed that multiplexing could decrease the bandwidth usage by passing the control packets, such as ACKs, once only instead of passing them separately for each stream. However, it turns out that ACKs (advertisements of free space in the receive buffer) have to be passed on per-stream basis anyway. The only difference is that they are sent on top of TCP instead of using native TCP acknowledgements. We end up with using 1 TCP acknowledgement stream and N acknowledgement streams on top of TCP. Which actually makes bandwidth usage worse not better. So far, the analysis have shown that multiplexing on top of TCP doesn't really solve the problems it was supposed to solve. It can even make them slightly worse. When using multiple TCP connections, each has to be go through its own "slow start" period. 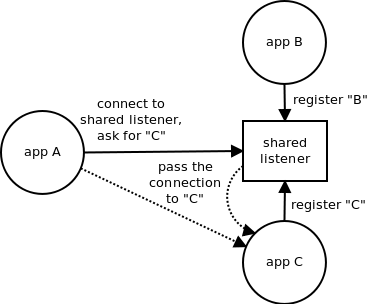 However, this is not a problem with long-lived connections which are the most common case in messaging middleware. It should be noted that using SCTP, with its channelling mechanism, would be more appropriate in this scenario than using TCP. Multiplexing on top of TCP in overall fails to deliver the advantages it is assumed to provide. Moreover, implementing such multiplexer basically means implementing custom TCP on top of the standard TCP (rx buffers, ACKs etc.). Such implementation will almost necessarily be buggy, it will have sub-optimal performance and it will just duplicate the functionality already present in the network stack. Thus, we get a lot of drawbacks with no associated advantages.